A-HOTEL.com - Luxury and cheap accommodation in Kryukov, Russia. 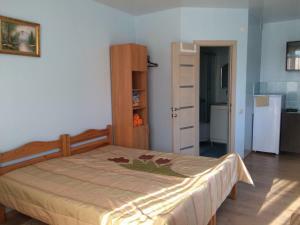 Prices and hotel, apartment booking in Kryukov and surrounding. Located in Vityazevo, 2 km from the Black Sea coast, Svetly Hotel features a barbecue and children's playground. You will find a kettle in the room. Located in Pyatikhatki, Guest House Kurortniy 17 provides accommodation with private balconies. Free WiFi is provided. Guest House Anapa24 is located in Pyatikhatki and features a bar. The guest house also features free WiFi as well as a paid airport shuttle service. Set in Pyatikhatki, Edem features a seasonal outdoor swimming pool and barbecue facilities. With a garden, the property also has a terrace. Guest House Briz is located in Nizhneye Dzhemete. Both private parking and free WiFi are accessible at the guest house. Boasting a seasonal outdoor swimming pool, Alpen Hof Guest House is located in Anapa, 11 km from Krasnaya Ploshhad Shopping Centre. Featuring free shuttle service, this property also provides guests with a barbecue. Situated in Pyatikhatki, 9 km from Anapa, Guest House Anastasia features free WiFi access and free private parking. A free transfer to the beach is available. Guest House on Aivazovskogo 38 in Nizhneye Dzhemete provides accommodation with a seasonal outdoor swimming pool and barbecue facilities. Featuring free shuttle service, this property also provides guests with a children's playground. Set in Anapa, 11 km from Krasnaya Ploshhad Shopping Centre, Guest House Miliena offers a seasonal outdoor swimming pool and terrace. With a shared lounge, the property also features a bar. Situated in Anapa, 11 km from Krasnaya Ploshhad Shopping Centre, Гостевой дом ИЛИМ has an outdoor swimming pool, barbecue facilities and a garden, as well as free WiFi. Featuring a shared kitchen, this property also provides guests with a children's playground. Situated in Nizhneye Dzhemete, 8 km from Anapa, Guesthouse Radost' features air-conditioned rooms and free private parking. The rooms are fitted with a flat-screen TV. Set 11 km from Krasnaya Ploshhad Shopping Centre and featuring free WiFi, Apartamenty na Pogranichnoy 4 features accommodation in Anapa. Every unit has a private bathroom and shower, air conditioning, a flat-screen TV and a microwave. Located in Anapa, 11 km from Krasnaya Ploshhad Shopping Centre, K.V.